Hortus Camdenensis | Camellia maliflora Lindl. Fully-hardy leafy shrub, similar to C. sasanqua, with elliptic, dark green leaves and peony form flowers 1.5 – 2cm across, in two shades of pink, in early spring. To 2.5m. [RHSE]. Introduced to Britain in 1818, brought from China by Captain Rawes. [Hilliers’]. It was figured in the Botanical Register as Camellia sasanqua var. stricta, ‘Mrs Parkes’ Camellia’, synonym flore pleno carnea, the name under which it was also figured in Loddiges Botanical Cabinet: ‘This was introduced about 1818 from China: it is a beautiful kind, flowering freely, and the blossoms are peculiarly delicate and pleasing. In growth it is more slender than the Camellias generally are, but requires the same treatment as the others, and like them may be increased by grafting upon the single stock: it should also be potted in rich loam, and preserved in the greenhouse.’ [LBC no.1134/1826]. ‘It seems to differ from japonica in being altogether smaller, and in having the upper branches and calyx furnished with a fine downy fur; it differs also from sasanqua in the habit of growth, which is rigid and compact, and not productive of long twiggy, recumbent branches. It is a very beautiful shrub and flowers freely.’ [BR f.547/1821]. In later discussion of Camellia sasanqua flore pleno Lindley commented: ‘It is essentially different from the plant given for it in f.547, which is now known under the name of C. maliflora.’ [BR f.1091/1828]. Chandler pl.2/1831. Listed in all published catalogues [T.275/1843]. Possibly obtained from Loddiges’ Nursery. It was listed as Camellia maliflora in both the 1830 and 1836 Loddiges’ catalogues held at Camden Park [CPA]. It was marked with an ‘o’, denoting not in the colony or new to the colony, in the 1830 edition, and marked with a ‘c’, denoting grown at Camden, in the 1836 edition. Camellia maliflora Lindl. is considered by some to be synonymous with Camellia rosaeflora Hook. 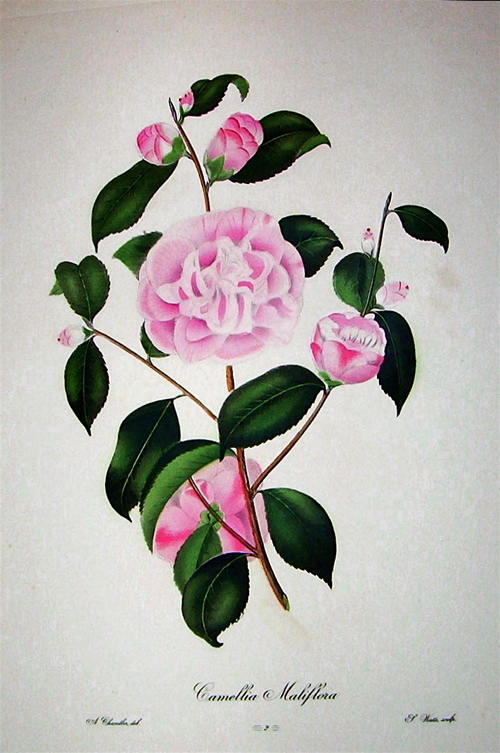 ‘This really handsome Camellia has been long cultivated in the Royal Gardens of Kew under the incorrect name of Camellia euryoides, Lindl., a very peculiar species, first figured and described by Dr. Lindley: the history of which is, that it was "a stock on which the Chinese graft their varieties of Camellia Japonica. The grafted portion of a Camellia brought from China for the Horticultural Society by Potts, in 1822, having died, the stock sprang up and produced this plant. The same having again befallen a Camellia brought home for the Society in 1824, by Mr. J. D. Parks, this plant again shot forth." Strange to say, nothing further is known of the original C. euryoides, and no systematic botanist, that I am aware of, has ever further noticed it. Our present plant, of which I know not the history, is quite different from this, more robust in habit, glabrous even in the young shoots, much larger in the flowers, which are pink-coloured. In some respects this approaches the C. assimilis Champ., in Hook. Kew Gard. Misc. v. 3. p. 310, and Seemann, Bot. of H.M.S. Herald; but there the flowers are solitary and terminal, the stigma is small and obscurely three-lobed, the pistil very hairy, as are all the free filaments of the stamens.’ [BM t.5044/1858]. Camellia sasanqua Thunb. flore pleno Lindl. Camellia sasanqua Thunb. flore pleno carnea Lodd.